Ca. 1850, elm, bamboo, Shanxi. 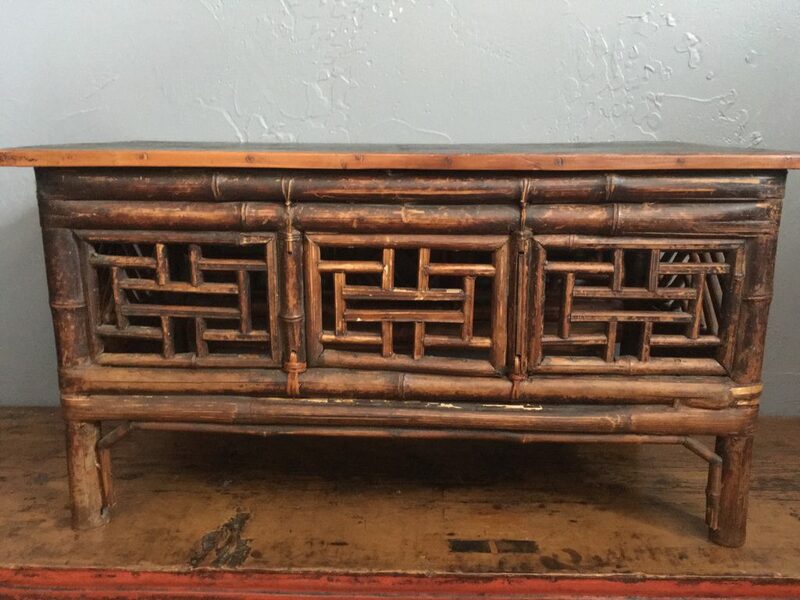 Rare because bamboo pieces often too fragile to survive the ravage of time. Good condition. 26″ w, 12.75″ d, 14″ h.
This Kang table is constructed with speckled bamboo, with a top panel of lacquered elm wood, creating a smooth top. The apron is worked with a zig-zag T-fret (meaning wealth) lattice design. The legs are reinforced by stretchers comprising of two layers. It was usually placed on a platform-bed to hold food and drinks for a scholar or official when he reclined on the bed to relax, or when not used for that purpose, for him to display a special vase or religious figure. A delicately-made table like this was highly valued by its owner. This table is in very good condition with a wonderful patina. Bamboo furniture is rare since not many survived the ravage of wars in China.